A wearable tribute to the changing face of Earth's silvery satellite. Inspired by the beauty of the lunar cycle, fine art photographer turned jewelry designer Lauren Beacham created this wearable tribute to the changing face of Earth's silvery satellite. Seven waxing and waning phases of the moon are represented by digital images set in a bib-style array of rhodium-plated bezels. It makes a shining addition to any lunar lover's ensemble. 18-inch chain—that's the height of an easy leap if you were walking on the moon. Handmade in Emmitsburg, Maryland. Love lunar? Make it a set with the Moon Phase Earrings. Do not submerge in water. Store with anti-tarnish square to avoid tarnishing. Great to dress up a simple white tee & jeans. I wish the chain was a bit longer; falls a little higher than I would have liked. I love this necklace but the chain was a bit too long. It sat in a weird place on my chest. I had to shorten it. 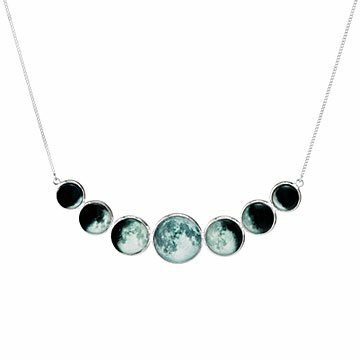 I love the design and the moon phases but the clasp is way to small (I have to get my husband to help me with it) and the necklace is not adjustable and the length is too long so that it either falls at the neckline of my shirts and ends up going behind it or it just looks weird. I do like the necklace so I'm going to go to a jewelry repair store and see if they fix it but I'm disappointed that I have to do that. Love this necklace! It is even more beautiful in person. Everyone loves this unique necklace. As soon as I saw this necklace I knew it would be the perfect gift for my sister. She was so happy with it... loves it! Chose this item for a gift because it was unique. Very nice product. Would have preffered a larger option. I have purchased several products from uncommon goods. I have never been disappointed. I look forward to every new catalog or email. love this neckless and the idea behind it! Nice workmanship - the stones are well set in. Very true to the photo in catalog.